Okay my creative friends!! The day has finally arrived!!! 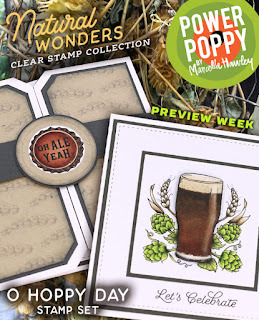 All the Power Poppy Natural Wonders stamp sets are available over in the Power Poppy store!! Do you have a favorite? A must have? Shoot...I could never choose because each and every one Marcella designs seems to fit a specific purpose at one time or another. Today we are featuring the Cabbage and Kale set. 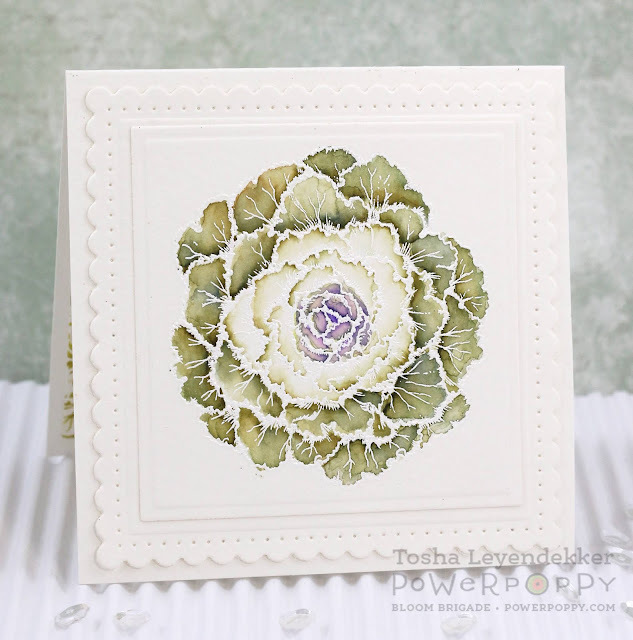 There are 4 varieties of cabbage/kale in this set and they are all so intricately designed. While researching the varieties on Pinterest, I noticed that many have white veining running through their leaves. 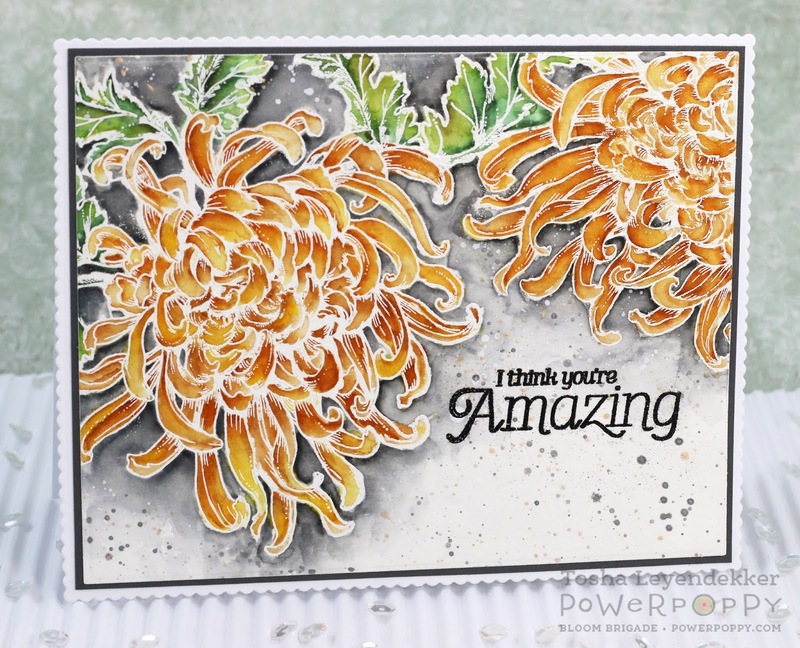 And since I had so much fun coloring the Chrysanthemum XL with my Zig Clean Color Real Brushes, I thought I'd give one of the ornamental Kales a go at this technique. 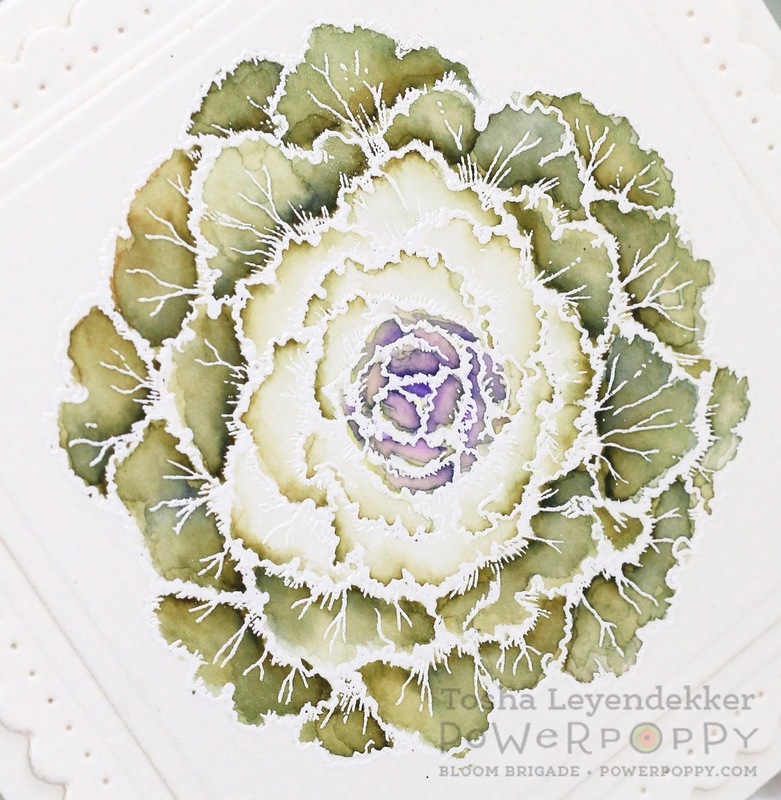 I decided I liked the image all on its own and framed it accordingly while adding another of the ornamental kales to the inside with a sentiment. Below you can see all of Marcy's precise details. I don't know how she does it, but I'm glad she does. 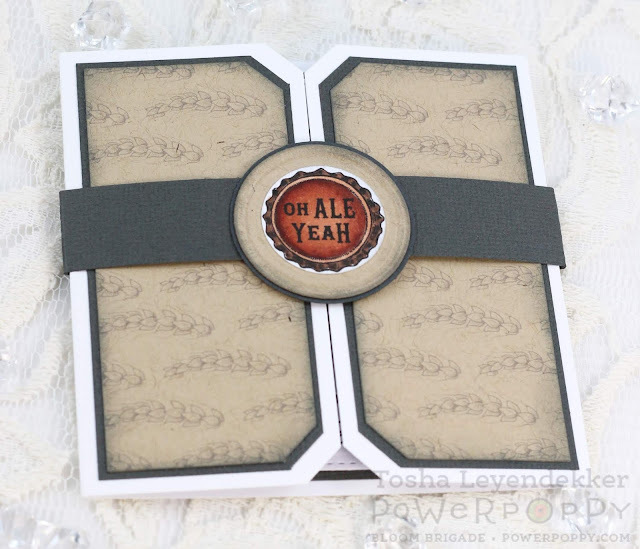 For the inside, I just took one of the smaller images, placed it in my Misti and lined it up where I wanted it. I then inked it up with Crushed Olive Distress Oxide (Ranger), spritzed it 3x with my Distress Sprayer (Ranger), and stamped it onto the watercolor paper. 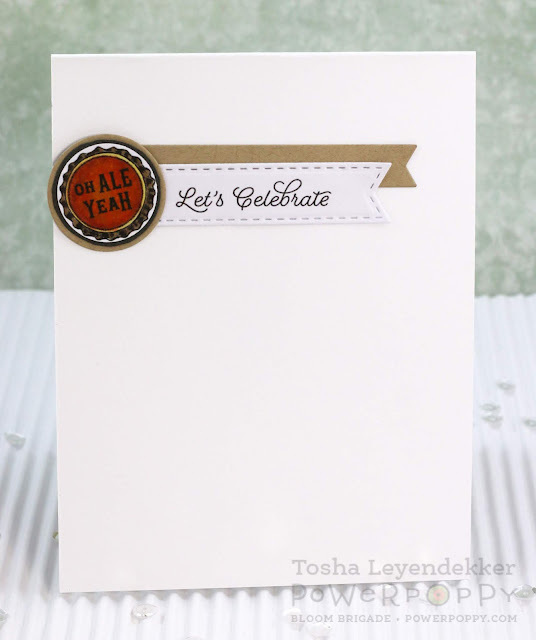 I heat-set it with my heat tool and stamped the sentiment over the top. 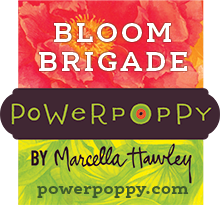 I hope you've enjoyed all the Power Poppy Natural Wonders previews this week. I sure have had a delightful time working with them and sharing them with y'all!! Happy Friday y'all!! Are you as ready for the weekend as I am? I hope you've been enjoying all the Power Poppy Natural Wonders previews. Don't you just love Marcella's creativity? Each set is phenomenal, and today's is no exception. 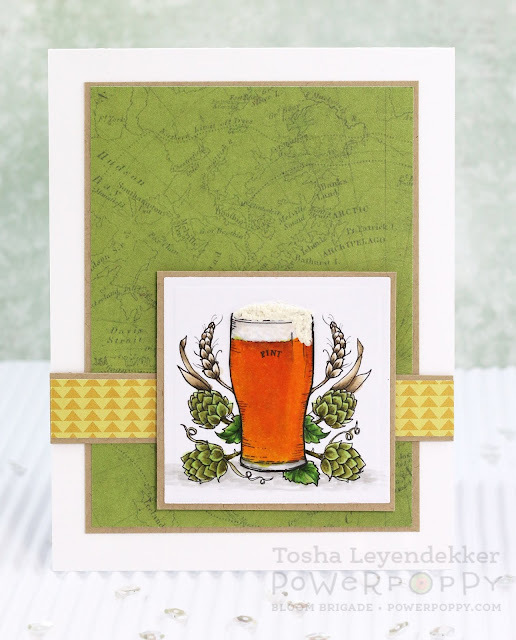 We are featuring a charming set called Fortune's of Fall. It includes 3 Fall images and 5 beautiful sentiments. I chose to work with the Zinnias. I had so much fun coloring the different vases and each unique zinnia! My card is pretty straight forward. No unique techniques were used. I just colored everything with Copics and framed them. I did add some white highlights to the terra cotta pot and turquoise one by using a white gel pen. That's it. Thanks so much for visiting!! Stop by tomorrow for our last preview, and then....you get to shop!! Woo-Hoo!!! Below, you can see I popped the glass up to give it some dimension. 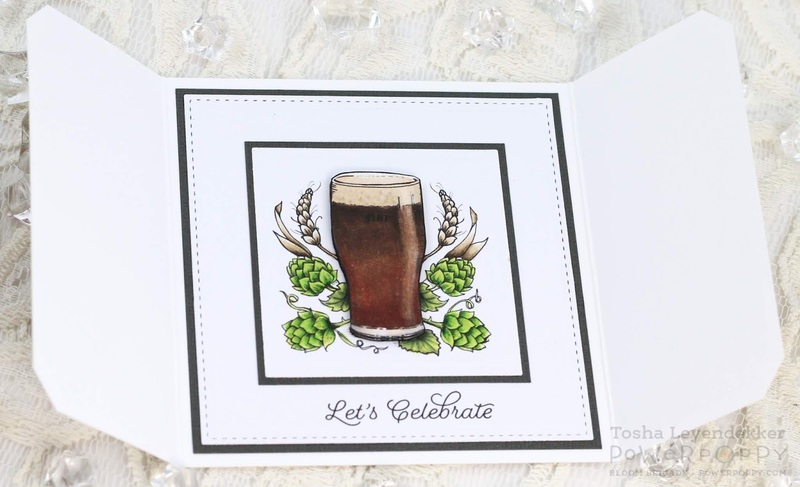 I love the bottle caps that Marcy included in this set, so I decided to make my first card a tri-fold card and include a belly band with the bottle cap on the front. I just adore that sentiment!!! 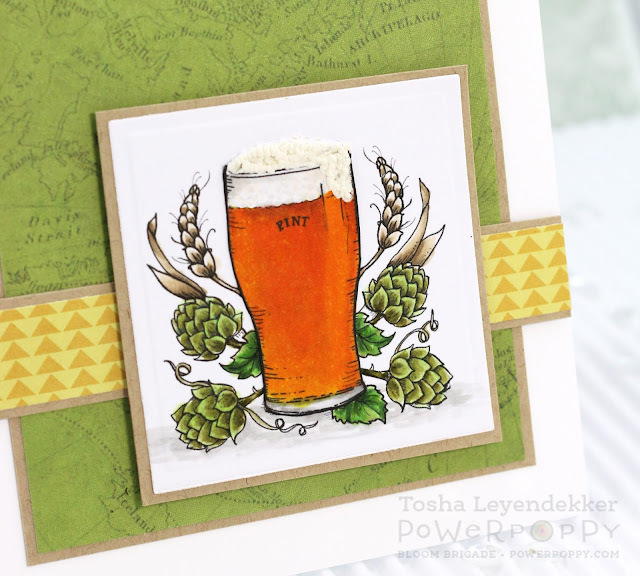 I also stamped the barley in a pattern on kraft cardstock for the front of the card. 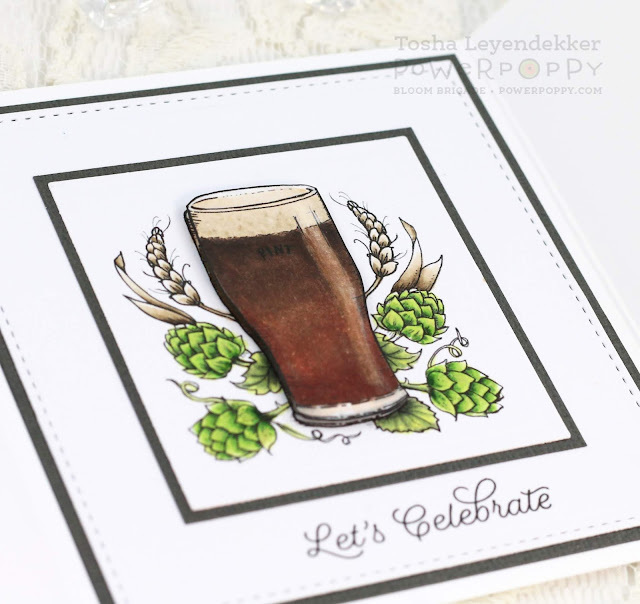 It's so easy to do with a Misti, and if you don't have one, the stamps are clear, so it's much easier to line them up precisely. For my second card I needed a lighter Ale for a Brother-in-law. I included some foam on top by adding some Liquid Applique. I thought it was a super fun and effective addition. Below you can see how I made the foam spill over the side using the Liquid Applique. For the inside, I just had to include the bottle cap again. I can't help myself. It's so perfect! Thanks for visiting!! 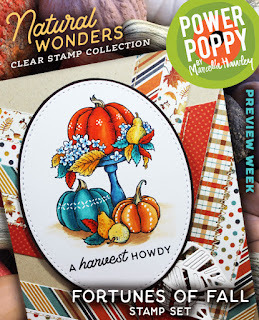 Be sure to stop by tomorrow for some Fall vignettes!! They are super charming.